HFPA President Meher Tatna opens the 2018 Annual Grants Banquet. Dozens of stars filled the Beverly Hilton’s International Ballroom this evening – not to receive Golden Globes but, this time, to announce $ 3.25 million granted by the Hollywood Foreign Press Association to 80 nonprofit and educational entities, 12 of them for the first time. Over the past 25 years the HFPA has given our $ 33.4 million to organizations focused on education, especially in film and television; film preservation; journalistic organizations committed to freedom of speech; as well as humanitarian organizations that support natural disaster relief and other international crises. 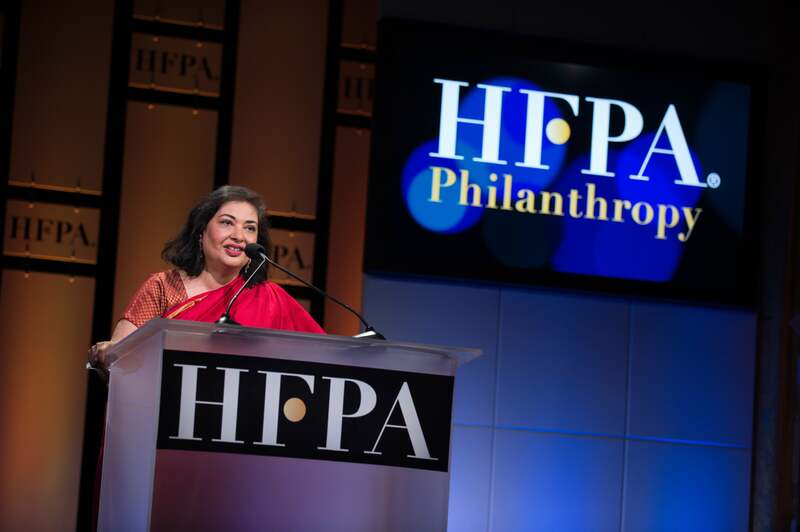 Opening the evening, HFPA president Meher Tatna reminded the audience of the significance of keeping the grants program going especially in difficult times, and asserted the commitment of the HFPA to philanthropy, and the continuation of the special events which have marked the 75th Anniversary of the Golden Globes. “Goodness still exists!”, exclaimed Billy Porter, summing up an extraordinary evening.